*. Herodes pinned Mogur with a powerbomb. **. Atlantida on Mascara Ano 2000 for the win. *. 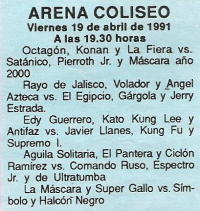 Rayo de Jalisco was supposed to be int his match. 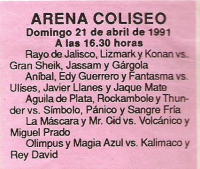 5) Gargola El Sultan, Gran Sheik, Jassam vs Konnan, Lizmark, Rayo de Jalisco Jr.
Jassam probably same person as Hassan. 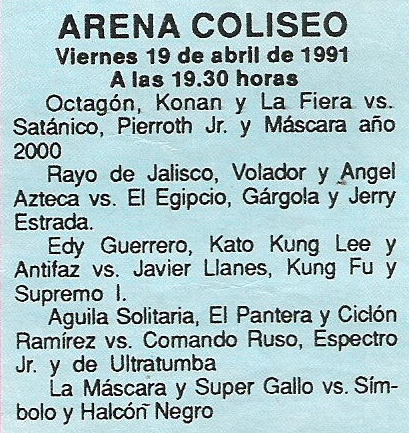 Konnan unmasked Mascara 2000 in the third fall. 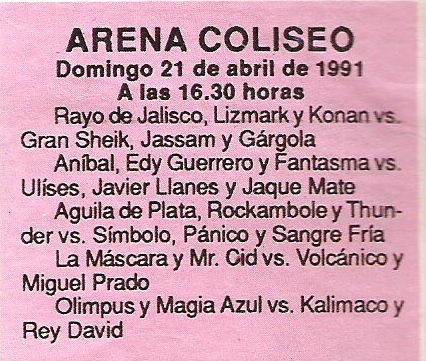 Cien Caras was 'injured' in the second fall. straight falls for a title change.